Boston charter school students outperformed their counterparts at traditional public schools and at charter schools in other urban areas by a striking margin over a recent six-year span, a Stanford University study found. The strides at Boston charter schools — in both math and reading — equaled what students would have learned if they had been in school hundreds of additional days each year, researchers said in the report, released Wednesday. The disparity held true for black, Hispanic, and low-income students in both math and reading, and was particularly strong for black and Hispanic students who live in poverty. “Boston charter schools have done exceptionally well improving the academic growth of their students,” said James Woodworth, a research analyst with Stanford’s Center for Research on Education Outcomes. The study seems likely to inform the long-running debate over whether Massachusetts should allow more charter schools. A group of supporters plans to file a lawsuit to eliminate the state’s cap on the number of charter schools, which are public but operate independently of traditional school districts and are given more room to design coursework. Nationally, urban charter schools on average achieved significantly greater student success in both math and reading than traditional public schools, said the study, which covered the academic years 2006-07 to 2011-12. “This research shows that many urban charter schools are providing superior academic learning for their students, in many cases quite dramatically better,” said Margaret Raymond, who directs the research group. The group, which studied charter schools in 41 urban regions, found that charters had a greater impact in math in 26 cities, and in English in 23 cities. In Boston, the average yearly academic growth for charter school students was more than four times that of their traditional school peers in reading. In math, the academic growth was more than six times greater. Critics say charter schools drain money from the regular school system, creating a two-tiered system, and do not take on the most challenging students, making them appear more successful than they actually are. Massachusetts currently has 80 charter schools, 34 of them in Boston, which is at its limit. Nearly 42,000 Massachusetts students, including 18,000 in Boston, are on waiting lists to attend charters. Richard Stutman, president of the Boston Teachers Union, which represents teachers in the traditional public schools, played down the study’s findings, saying charter schools have substantially fewer students who are learning English as a second language. “Given the cherry-picking of students, I’m not surprised at all that their scores are higher,” Stutman said. Stutman, citing the study, noted that just 8 percent of Boston charter school students are English-language learners, compared with 30 percent in the traditional schools. While the gap among special education students was far smaller — 17 percent for charter schools and 21 percent for the district — Stutman contended that charter schools have relatively few students with serious disabilities. Charter school advocates reject that argument and note that enrollment is determined by lottery. This month, Los Angeles administrator Tommy Chang was named as the next superintendent of Boston Public Schools. Chang, a former charter school principal, has a reputation for giving schools more freedom to hire and develop budgets, and said he plans to narrow the achievement gap with a focused effort to improve classroom instruction. In a statement Wednesday, interim Superintendent John McDonough said the school system has made “great progress in recent years,” and is taking bold steps to continue the progress. “We are extending the school day and providing schools with the flexibility to build effective teams by allowing teachers and school leaders to make hiring decisions together,” he said. 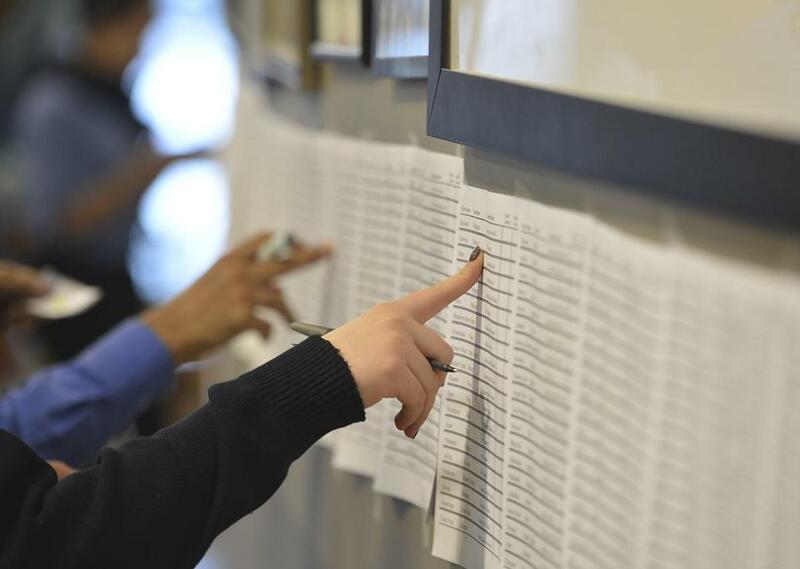 The study compared standardized test scores of charter school students with the scores of Boston Public Schools students with similar demographic backgrounds. It found that the average academic growth of charter school students surpassed public school students in both mathematics and reading, and at each level from elementary to high school. Stanford’s Woodworth said urban charter schools were improving over time. The disparity was often strongest, he said, among low-income, minority students who have typically struggled in school. “These are major differences in growth,” he said. Robin Lake, director of the Center on Reinventing Public Education in Seattle, said that Boston’s charter schools can draw from a reservoir of talented educators, and that Massachusetts has adopted rigorous screening and oversight to ensure the schools are well-managed. “Parents don’t really care what the school is called,” she said. Jon Clark, co-director for Brooke Charter Schools, which has schools in Mattapan, East Boston, and Roslindale, said charter schools provide a longer school day and give students intensive personal attention. Principals have the freedom to hire a staff and craft a budget as they see fit, he said. Clark rejected the “cherry-picking” argument and said the success charter schools have shown with low-income black and Latino students is the true indicator. “If you really care about the achievement gap, you can’t look at these numbers and dismiss them,” he said. Catherine Cloutier of the Globe staff contributed to this report. Peter Schworm can be reached at schworm@globe.com. Follow him on Twitter @globepete.